Purchase this product now and earn 998 Points! Introducing the Green BPA Free Gym Water Bottle which holds 2.2 litres. If you find that the average bottle just doesn’t carry enough fluids for the whole day, then the 2.2 litres BPA Free mega bottle is just for you. 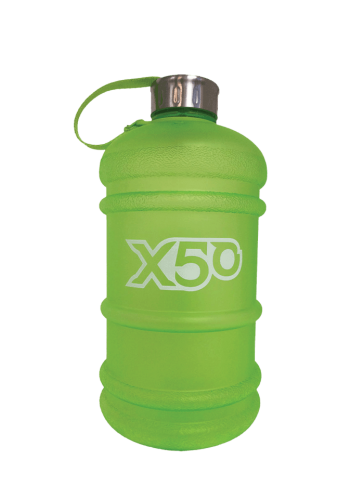 It’s the largest solid bottle in our range, made from lightweight BPA Free Tritan plastic. It comes standard with a stainless steel cap which is attached and the moulded handle is large enough for any hand. The BPA free plastic is a non-porous, glass-like material and provides clear fresh water with no leaching of that plastic taste. With a wide 5cm opening it is perfectly suited for everyday use, weightlifting, gyms, hiking, camping & CrossFit!